Ryman League clubs are looking forward to the new football season with excitement following the release of their fixture list this morning. Bognor Regis Town kick-off their campaign on Saturday, August 13 with a home game against Lowestoft, followed by a visit to Merstham on Tuesday, August 16. Worthing face a comparatively long journey to north London for their opening game at Hendon, followed by a home game on the Tuesday night against Met Police. Burgess Hill Town visit Needham Market on the opening day and are then home to Enfield Town on Saturday, August 20. In the South Division, Lewes travel to Surrey club Chipstead in their opening game, followed by a Tuesday night home game against Walton Casuals. Horsham celebrate their return to the league with a home game on Saturday, August 13 at YMCA’s Gorings Mead ground against Carshalton Athletic. The Hornets then visit Kent side Greenwich Borough on Tuesday, August 16. Crawley-based side Three Bridges have a home game at Jubilee Field against Kent club Chatham Town. East Grinstead are pitched away to Molesey for their first game on August 13, then host Dorking Wanderers on Tuesday, August 16. There will be some fascinating local derby battles on Boxing Day at Bognor Regis when the Rocks will host Hampshire club Havant & Waterlooville. 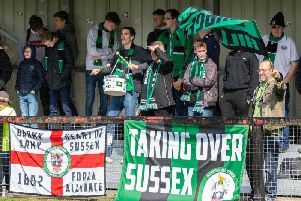 Burgess Hill will be up against Worthing at home at their Green Elephants Stadium. Matt Longhurst’s East Grinstead will have a very short trip down to Three Bridges, while Hastings entertain Lewes.